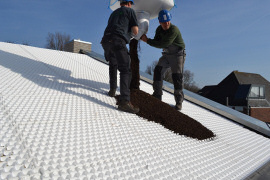 Optigreen have developed a new and cost effective anti-slip system for extensive pitched green roofs. Called the Optigreen Type P system, it uses their new FKD 58 SD board and is suitable for sloped roofs between 15 and 35 degrees pitch. The specially designed drainage and water storage board is manufactured from pressure-resistant EPS (Expanded Polystyrene) . It possesses high water storage capacity, provides uniform water distribution and at the same time has good drainage capacity. The FKD 58 SD board is applied directly to the Optigreen protection and water storage mat type RMS 500 with the unique surface pattern of the board providing the anti-slip provision for the substrate layer. Request more information about the Optigreen Type P System or other products here. Images and text may be downloaded and published providing Optigreen is quoted as the source.